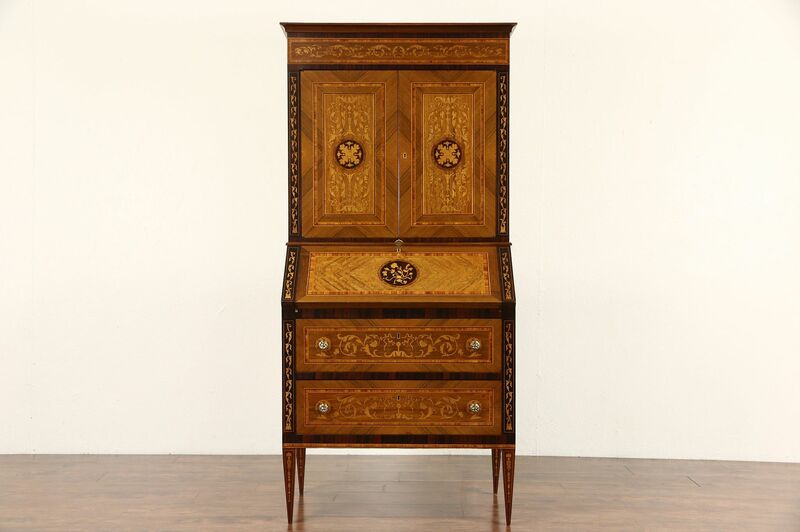 A spectacular example of traditional Italian inlaid marquetry, this 1930 era secretary desk has genuine rosewood, ebony, tulipwood and satinwood. The restored satiny finish is in excellent condition on this European vintage library furniture. A key works all locks, brass hardware is original. Inside the dropfront are drawers and cubicles for documents, all with matching marquetry and banding. Two large drawers have dovetailed joints. The upper section with shelves is removable. Measurements are 35 1/2" wide, 21" deep, 73 1/2" tall and the desk top is 31" high.